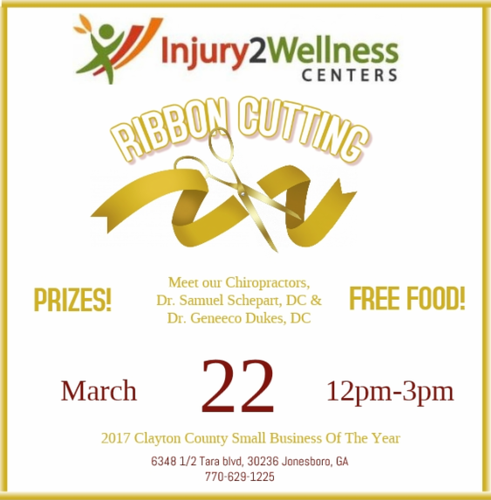 Injury 2 Wellness Centers opened our Jonesboro office back in 2015, but never had a proper ribbon cutting and grand opening. We are taking this opportunity to have a (re) grand opening and ribbon cutting as well as introduce our new chiropractor, Dr. Samuel Schepart. We are the proud ricipient of the 2017 Clayton County Small Business of the year award and are looking forward to serving our community for many years to come. Come see our office and meet our clinic director, Dr. Garcia and the rest of the I2WC team!